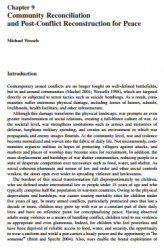 The purpose of this chapter is to examine diverse methods of community reconciliation and peacebuilding following armed conflicts in sub-Saharan Africa. Three case studies from Angola, Sierra Leone, and Liberia, respectively, emphasize reconciling formerly recruited young people, defined as people under 25 years of age, with communities in rural areas. Although the case studies emphasize the importance of community empowerment and reliance on local cultural understandings and practices, they also point out the value of constructive partnerships between Western psychology and local practices.